facilities that heal mind and body and Kyoto's legendary hospitality and care. We will do whatever it takes to ensure each guest is comfortable. “Leveraging the abundant wisdom of Kyoto"
Reflecting how we provide the essence of wisdom and hospitality, synonymous with the ‘Millennial Capital of Kyoto’, to all our guests. This is how ‘THE THOUSAND KYOTO’ name came into being. Using a corporate logo incorporating one more circle than the symbol for infinity (∞) denotes ‘1000’ while also embodying our wish to strive for ‘millennial and infinity-inspired’ service that champions comfort. Moreover, it also signifies ‘mizuhiki’, a Japanese style of knot, representing our commitment and proximity to guests, as exemplified in the symbolically glowing motif; prominently worn by each member of staff. From the entrance appointed with a tsuboniwa garden, enter a narrow passage reminiscent of a toriniwa in a Kyomachiya townhouse. Beyond there, the expansive grand staircase leads you to the hotel's main okuniwa garden. The use of greenery in Kyoto to welcome visitors is recreated in this layout inspired by Kyomachiya townhouse gardens. Feel the refreshing breeze and changing seasons in the main okuniwa garden where trees and plants portray Kyoto's beautiful mountains. Arising from Zen minimalist philosophy of ‘less is more’, our facilities and services are characterized by simplicity and comfort rather than lavish décor. Our hotel is filled with light, greenery, and wind drawing upon the ingenuity of Kyomachiya townhouses that harmonize with nature. Embodying the wisdom of Kyoto and the bonds forged with nature. Delighting in the greenery and airy wind. Fluttering in the breeze and changing with the seasons, we make providing comfort an art form. The room is not just simple, it incorporates Zen ideology and is designed with attention to high quality so that our guests can truly relax. The soft light from the textured washi paper and calm colors are sure to soothe your travel fatigue. THE THOUSAND KYOTO restaurant is the dining venue that lets you enjoy your choice of cuisine your way, whether Italian, Japanese or a bite at the TEA & BAR. Please enjoy dishes our master chefs create from the freshest and most authentic ingredients. A premium space that epitomizes the elegance of Kyoto. Providing you with the most memorable moments, service from the heart and fine food so that all guests have a comfortable stay. Among the attractions on offer: a hot bath, bedrock bath and dry sauna (latter of which male only). Ease mind and body into a soft-lit world of healing. 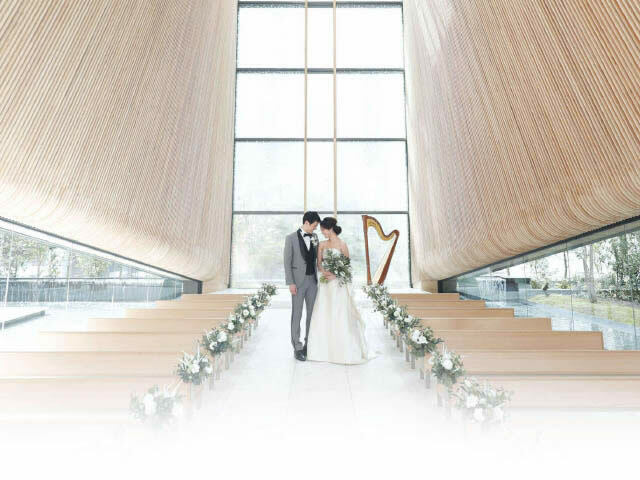 Within the "KOMOREBIDO" chapel of water and light, ringed by trees, weddings unfold in a way that keeps the couple and their families and friends feeling perfectly at home. Approximately a2-minute walk east from JR Kyoto Station Central Gate. Ideally located, just a couple of minutes from the central exit of JR Kyoto Station. The perfect Kyoto sightseeing hub, with buses, taxis, subways and major transportation facilities all a stone's throw away. Look forward to our insider tips and insights into authentic Kyoto, as our in-house staff give you the lowdown on the best go-to venues and scenery. Reveal the heart of the city with Thousand Stories Kyoto. COPYRIGHT © THE THOUSAND KYOTO ALL RIGHTS RESERVED.